Right now, there are more ways than ever to make your manicure stand out. Using gorgeous metallic and mirror nail polishes, you or your manicurist can create amazing and unique nail art. Below you’ll find a variety of nail polish designs that span from beginner to professional skill levels. Have a look and see if any of these nail art ideas strike your fancy! This nail art is special because each nail involves a unique design. Some of the nails are accented with gold triangle decals and stickers while other nails employ the use of silver mirror polish. The overall theme of these nails is triangular patterns and straight lines. Pick just one of these nails as inspiration for your manicure or copy the entire design! You can rock this silver mirror look regardless of whether you have short or long nails. You can even do it at home if you own a UV light – you’ll also need to buy special mirror powder to transform your nails over a coat of black gel polish. Otherwise, ask your local nail salon to do it professionally. If you love the look of multiple nail polishes one hand, you might dig this nail look. It’s perfect for those days when you can’t decide between matte, glossy, or metallic. This artist has used black, gold, and white, but you can choose any color you want! If you’re in the mood for some classy nails, add some gold sheen to your matte pink manicure. The “V” shape of the metallic gold tips adds an interesting detail and elongates your nails. File your nails down to a rectangular tip if you want to copy the full nail look. This design is particularly good if you currently have or are planning on getting acrylics. The rose gold polish is achieved by adding mirror powder onto a light pink base. You can add an accent nail of your choice (whether it’s your thumb, ring finger, or both), embellishing it with small beads or rhinestones around the cuticle. This particular look takes a skilled nail artist to create! This artist has blended clear, magenta, and gold reflective nail polish into a perfect gradient. Top it off with long pointed tips and prepare for everyone to ooh and ahh over your manicure. This manicure is perfect for those of you who secretly wish they were mermaids. You will love this manicure inspired by the metallic hues of mermaid tails and fish scales. Add a little marine magic to your life, but get to keep your two legs in the process! Make your manicure even more memorable by shaping your nails into pointy claw shapes. Anyone can get this metallic nail look with the right nail polish! If you aren’t going for gel at the salon, look for a holographic shade in deep purple or blue and apply as you normally would, with a base coat and a top coat. This is the perfect look for nail art beginners as it’s stunning, yet no-fuss. Take inspiration from the world’s favorite precious metal and get this gold broken mirror effect. If you’re trying this at home, you don’t have to use gold leaf to get this look—you can use anything from gold stickers to gold nail foil. Place the gold flakes on top of a black background and set them in place with a good-quality top coat. Here’s another nail look that you won’t need DIY expertise for. All you need is a nail polish with reflective metallic properties! There are a variety of brands that make these types of nail polishes, including this polish from Korean brand Nfo-oh. Use your normal base and top coat and you’ll be good to go. These nails are so holographic they may very well be visible from space. Match your silver holographic shoes or handbag for a sweet ’90s throwback look, or adorn your hand with midi rings and on-trend jewelry pieces for an updated look. Warning: you may not be able to stop staring at your fingers! Paint at your own risk! If you’re looking for something that incorporates a lot of shine and a bit of bling, then look no further. This pink mirror manicure is extremely sleek and girly. The rhinestones add glamour and excitement to the manicure, making this perfect for anyone who wants to show off their gorgeous talons. The French manicure is a classic for a reason, but why not give it a modern twist? Perfect for interviews, work, or any other occasion, this manicure makes a statement without being over the top. To get this look, pick a gray or dark silver nail polish that’s not too glossy to create a contrast with the metallic silver tips. We can’t get enough of the fragmented mirror look. If you prefer silver over gold, why not try your hand at this nail art? You can use this design on just one or two accent nails or as a full manicure. It would look great with pink gel polish, as shown, or any other color, such as teal. You can recreate this look by using clear or light pink nail polish as a base for the silver flakes. Add a layer of silver glitter and finish off with a top coat. You don’t have to use a lot of color or glitter to get a wow-worthy manicure. This modern manicure incorporates metallic gold and black accents over a matte black base. There’s something so appealing about mixing matte black with metallics, and you or your manicurist will be able to create a chic pattern incorporating one or more gold stripes. Warning: these nails may make you feel like you have superpowers. You or your manicurist will be able to copy these stunning metal nails using mirror powder with gel polish and a UV light. They remind us of neon concert lighting and sleek tinted metal. What’s not to like? We’ve seen a lot of nail art with different colored tips, but these delicate designs add interesting details to the tips. You can take inspiration from this manicure even if pink isn’t your favorite hue. We love the stark contrast between the metallic and the mattes, and the jewels on the middle finger add a touch of glam. Get in on the space-age trend while adding a little color to your look. You’ll need lavender gel polish and mirror powder to achieve this look. You can do this look on fake nails or natural short nails – whatever the case, your nails will surely stand out. If you want this particular rainbow metallic look, get yourself some nail polish from indie brand ILNP. This particular shade, Maiden Lane, will for sure jazz up any outfit. The darker colors in this rainbow metallic polish give it a cooler metallic feel, perfect for fall or winter. Just because you’re following a trend doesn’t mean you can’t personalize it to your own tastes. This manicure is a must for any pastel fan. Why settle for just one color when you can have five? If you’re going to attempt it yourself, you’ll need five different pastel gel polishes and mirror powder. It doesn’t have to be Halloween to indulge in a little witchy style. This glossy nail look appears to give off a marbling effect. This shade is so unique that the reflection will be different in different lights. These would look fantastic with a small rhinestone glued to the base of the nail if you wanted to add some sparkle. This fragmented mirror look creates an effect similar to a stained glass window. These beautiful reflective stickers cut into large, chunky shapes reflect purple, blue and silver hues, giving off a general opal vibe. It would go perfectly with any opal or iridescent rings you may have. If you want to wear gold nail polish but don’t want to make a big statement, consider a minimalist manicure like this one. 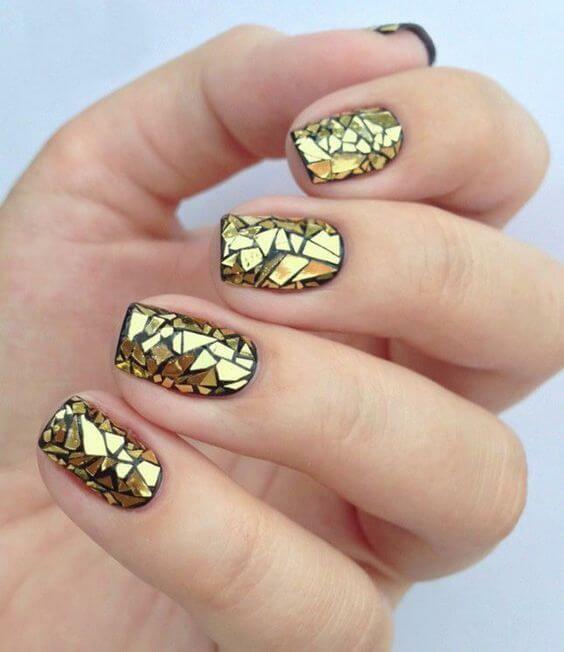 You can use any type of gold nail polish or nail sticker, whether it’s metallic, glitter, or glossy. It isn’t a lot of effort, but the result is extremely beautiful. We love this black and metallic gold look. It’s both artsy and sleek in design. If you’re going to DIY, you’ll need very thin gold stickers will give you the precision you need to recreate this look. You can also use gold leaf or foil for the other nails. Decorate your nails with this funky and stylish design of glossy matte polish and shimmering metallic triangles. To keep things interesting, invert the triangles on every other nail. To get a perfect triangle shape at home, use tape to get an even line. The trickiest part will be getting the triangles all the same size. Use a paper stencil to guide you if you’re having trouble. If you or your manicurist is up for a challenge, try creating a holographic design with a rainbow metallic nail polish such as the one pictured above. To keep things from becoming too monotonous, pick one of your nails to be the accent nail and layer with chunky silver glitter. Mesmerizing!